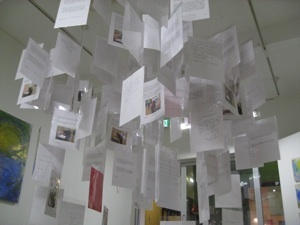 MESSAGES - メッセージ - The artist use messages, which are from the people in New York to Japanese who suffered the disaster on 11th March 2011, in this installation. 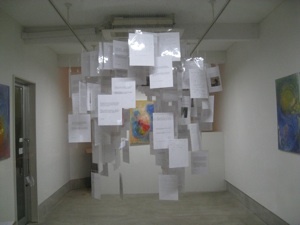 He and participants create a sphere in the air using the messages. The sphere represents peace, love, cooperative relationship with others. There is a tunnel inside of the sphere which lets people be able to go through the sphere as they read the messages. The tunnel means difficulties in our life which we have to get through. At the end of the tunnel, the viewers encounter a piece of painting showing positive meanings such as hope, beloved ones, the future... All photos below are the views of the solo exhibition at Gallery chifuriguri in Sendai, Japan. 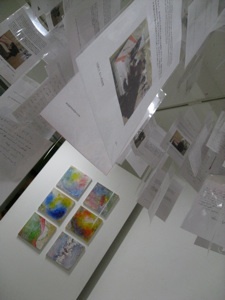 The exhibit took place 3rd through 7th May in 2012. I express my condolences and compassion to the victims of the huge disaster in Japan. I pray from my heart that everyone will peacefully get over the hardship. And I hope they will get back to normalcy as soon as possible. I started a project below from march 14th 2011.
and help people recreate energy for the future by themselves. I have not stopped feeling sad and crying since the huge earthquake and the tsunami occurred in Japan, especially when I saw the scenes of disasters through media reports. I had been thinking about that what I wanted to do for the victims. I was not thinking that there was nothing I could do for them just because I am here in NY now. So, I started this project on March 14th. 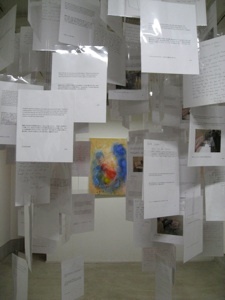 I have been creating conceptual art work using letters and messages for years. My experiences enabled me to create this project. I will create a piece of art work using messages from the people in NY and will send it to Japan so that the victims can read the messages. The communication between humans transcends everything like the differences of races and languages or the borders and issues between countries. The messages from someone’s heart reach others’ hearts without any question. wrote this message : “Keep your spirits high! Never lose hope! To God be your glory! The road to life is never easy! But hold on to your faith! Be strong! It is not an easy. Road at this moment. For the people of Japan!” He was very worried about his friends in Japan and got his eyes red and watery. I introduce some more messages below which I have received. I finally completed translating the messages from Japanese to English. They are 354. It took me over six months to interpret them. It was a precious experience for me to meet the warmth of the people's hearts. I often moved and cried while I was reading them : How warm their hearts are! On the other hand, It was a long journey, as I mentioned before. 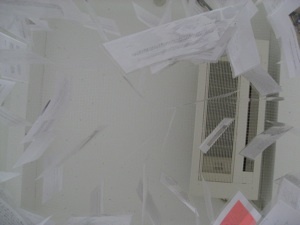 I piled up undone messages on my desk and saw them every day. I, to tell the truth, sometimes could not do it because I was overwhelmed by the people's sensations, which came from both sides, Japan and New York. I realized how strong people's thoughts are especially when people face serious facts. 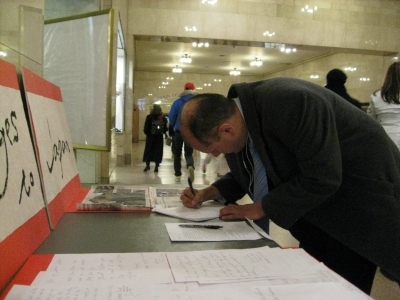 These messages were mainly collected in the Grand Central station in New York from March to May in 2011. I will be so glad if this project is a bridge of communication between the Japanese, especially the victims of the disasters, and the people in New York. I really appreciate the participants and the people who have been interested in this project and have helped me a lot. Below are the people ; the staffs in the Grand Central station, my classmates in Rennert who helped me to translate from Spanish, Portuguese and German to English, the staffs and teachers in Rennert, the Prof. King, East Asian Art, and her class at the Southern Connecticut State university, . 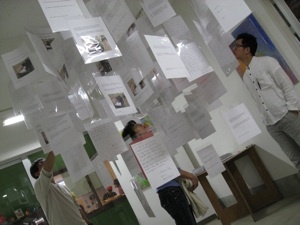 I have been searching the place to exhibit " MESSAGES" so far. I will appreciate it if you give me the information. 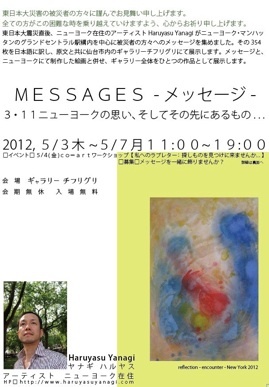 MESSAGES -メッセージ - 3・11 ニューヨークの思い、そしてその先にあるもの . . .
To the Japanese people, The people of Haiti share your grief . 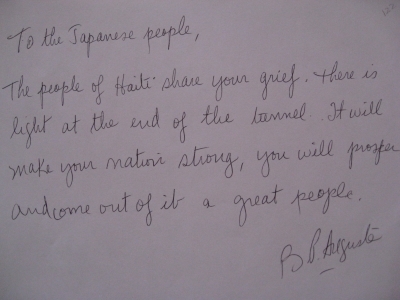 . .
To the Japanese people, The people of Haiti share your grief. There is light at the end of the tunnel. It will make your nation strong, you will prosper and come out of it a great people. This was written by a woman who seemed to be in her 50's or 60's. To the people of Japan, Here in New York City we have seen . . . This was written by a woman who seemed to be in her 20's or 30's. She told me that she had Japanese friends in Japan and NY. Dear friends, You are the most amazing people . . .
Dear friends, You are the most amazing people I have ever seen. I am so sorry that you have to go through so many problems at the same time. You have helped the whole world during there're needs and I am praying everyday to God to help you recover. I have started looking at you as miracles of humanity. This was written by a woman who came from India and was living in NY. Dear friends, I am so sorry for your loss . . .
Dear friends, I am so sorry for your loss. We have been watching, with regret, the difficulties. Japan is undergoing. We are with you in spirit and admire your strength and courage. Our hearts are with you. This was written by a middle- aged gentle man. Dear friends, We are praying for you and . 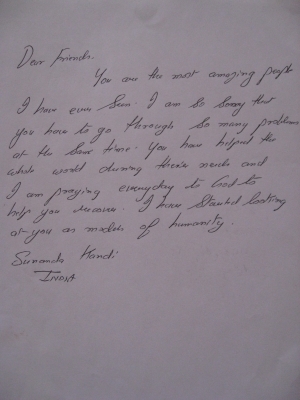 . .
Dear friends, We are praying for you and thinking about you all the time. We hope that you know we are here for you always. Our thoughts are with you. We "AI" love you. May you be safe and rebuild your wonderful country. This was written by a woman who came there with her two children. To everyone there in Japan, You are in my thoughts . . .
To everyone there in Japan, You are in my thoughts and prayers every day. I know you are a strong group of people and will come out on top again. God bless each and every one of you. This was written by a woman who seemed to be in her 40's.